Venus is known both as the "planet of love" and the Earth's "evil twin". And although research suggests its environment is more hellish than romantic, there's actually a lot we don't know about our celestial neighbour. Now Japanese scientists have made a surprising discovery: an enormous, bow-shaped feature in the planet's cloud region which seems fixed to the slowly rotating planet. Clouds around it, on the other hand, whizz by at about 100 metres per second. So what is it? Venus is almost as large as Earth but orbits closer to the sun. A spacecraft approaching the planet would see chevron-shaped structures in the clouds, due to the rapid "super-rotation" of its thick atmosphere well above the surface. Before the space age, it was thought that Venus would be somewhat similar to Earth. Indeed, the expectation in science fiction was that the planet may support life, with thick vegetation under water-rich clouds. But spacecraft have shown us that Venus is lifeless and very different to our own planet - and the clouds are sulphuric acid. It has the hottest planetary surface in the solar system (720 Kelvin or 447°C - hot enough to melt lead), a thick atmosphere (92 times Earth's atmospheric pressure) and no protective magnetic field. Its rotation is slow - and the wrong way around (243 Earth days) - and it has hurricane force winds and strange vortices near the poles. The early missions, including Mariner, Venera and Pioneer Venus determined the composition of the clouds and measured the atmospheric structure. The Russian Venera landers, the only craft so far to have landed in the harsh Venus environment, showed images of lava plains and volcanic terrain. Later the Magellan mission, which used radar to peer under the clouds, allowed mapping of the volcanoes and lava channels in detail - revealing a young surface with relatively few craters. This shows that the planet was resurfaced by volcanic activity about 500m years ago. More recently, Venus Express has shown possible signs of some volcanism within the last 100 to 10,000 years. The super-rotation of Venus' atmosphere makes it very different from Earth. At the cloud level of 50-65km, where the atmospheric pressure varies between the Earth's surface pressure to 10% of that, the speed of rotation is up to 100m/s - about 60 times the speed of the planet's rotation. This is higher than a hurricane force on Earth. By contrast, Earth's fastest winds are only about 10-20% of the planet's rotation speed. Although the super-rotation is not fully understood, Pioneer Venus showed that the high speed reduces through the lower atmosphere, eventually rotating with the planet at the surface. The new study reporting the discovery of the bow-shaped structure, just published in Nature Geoscience, is the most recent result of the mission. The wave was caught by Akatsuki's imaging instruments - looking in the infrared and ultraviolet parts of the electromagnetic spectrum. 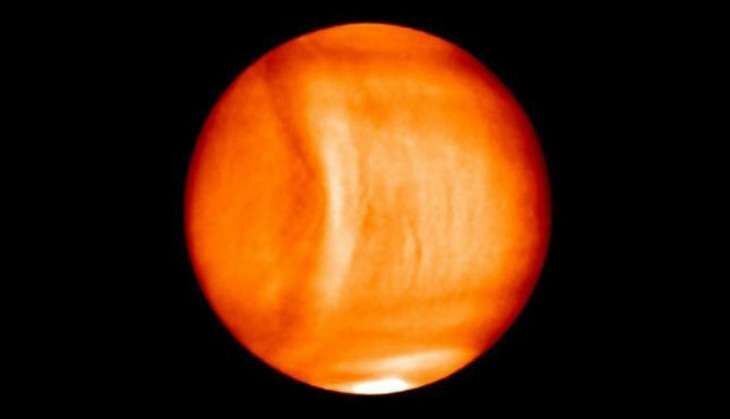 The astronomers analysing the data noted that the structure extended 10,000 km through the Venus cloud tops and persisted for a few days, then suddenly disappeared. The researchers suggest that a stationary "gravity wave" (which is different from a gravitational wave) in the atmosphere might cause the effect. Gravity waves are generated at the boundary between the atmosphere and a surface, or between horizontal layers in the atmosphere, when the force of gravity opposes buoyancy (ability to float). An example on Earth is the wind waves on the sea - just between the atmosphere and the ocean. There are also gravity waves over mountainous terrain, which form when air ripples move over a bumpy surface. Gravity waves on a larger scale can also be seen in the upper atmosphere between different layers. Gravity waves seen by Venus Express. 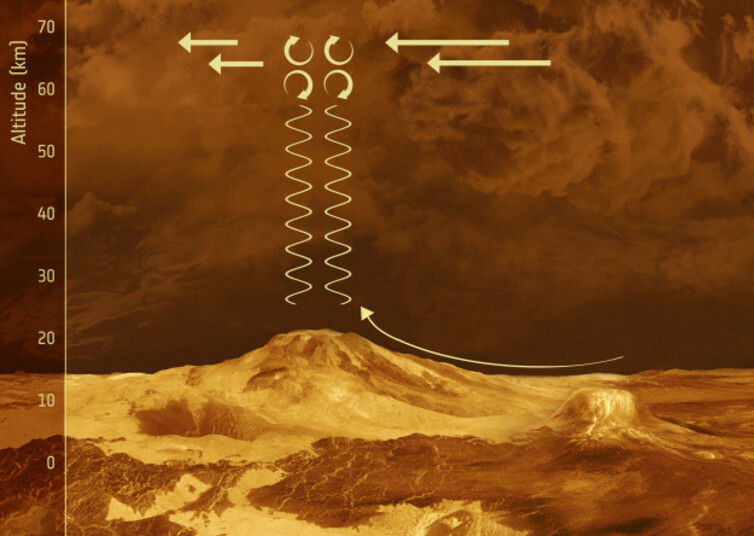 The discovery illustrates that, although we can explain some of the features of the thick, fast Venus atmosphere, it appears that low-altitude atmospheric dynamics are not fully understood yet. But we are slowly uncovering the planet's secrets and the latest study is certainly making waves.